I love to find ideas about recycling or re-purposing household items in garden projects. Someone else’s trash can always be a garden treasure. 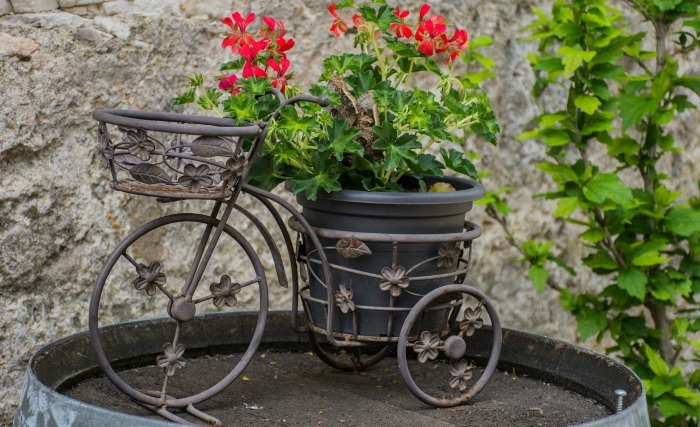 Bicycle planters make great garden accents for both annuals and perennial plants. 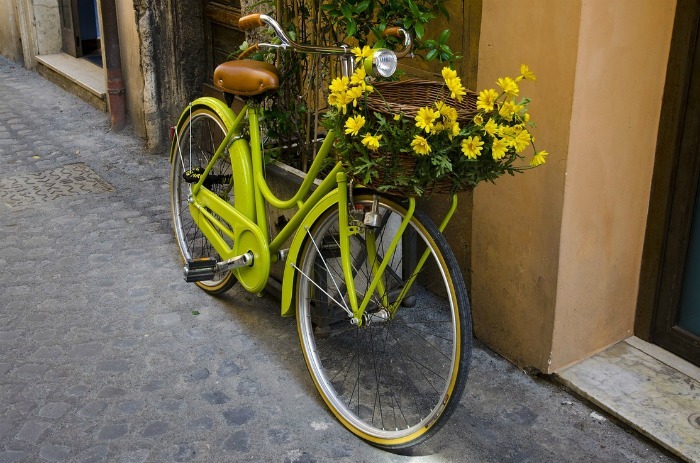 Many bicycles have baskets or back carriers which are the ideal spot to tuck away some flowers and vines. The frames are often colorful and bright, so that you can get creative and coordinate the plants you use to the bicycle color. 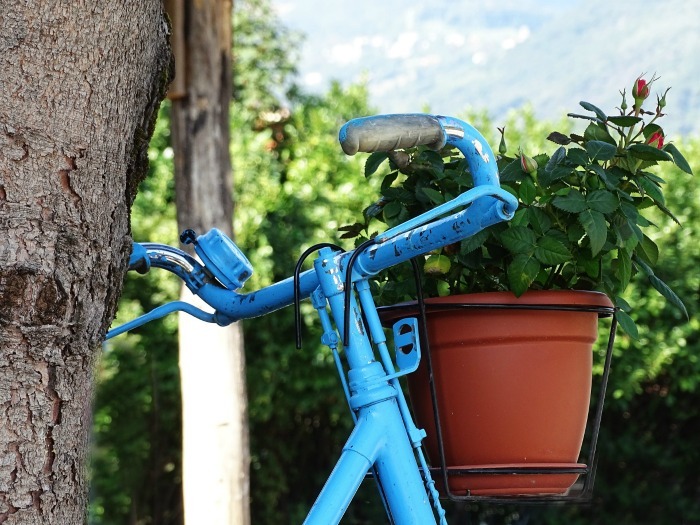 These fun and whimsical planters made from bicycles would be right at home in any cottage garden. 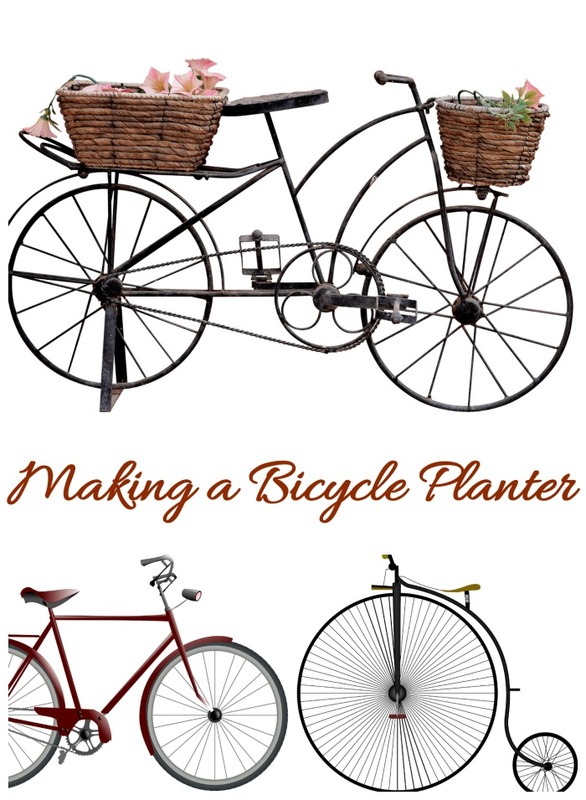 Creating a bicycle planter for your garden is very easy. You can go all out with paint or keep the vintage look. 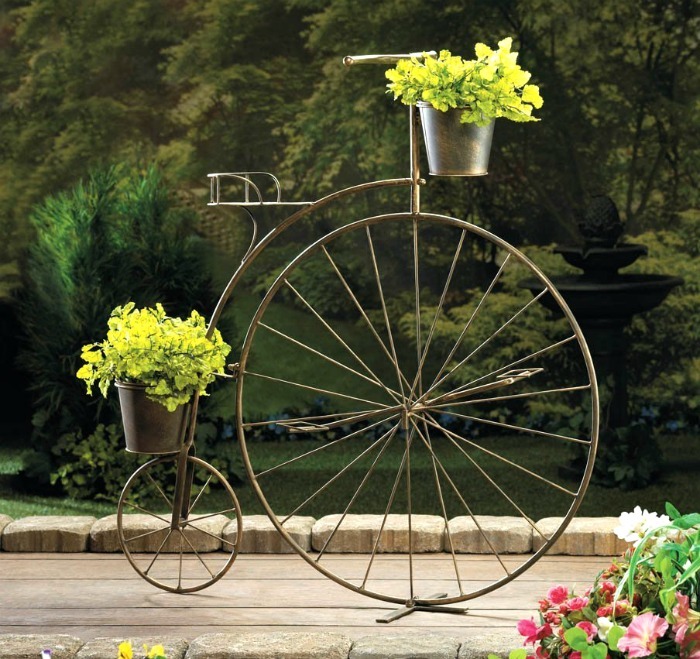 Just let your imagination go wild to add a fun 2 wheeled look to your garden setting. To start your project, all you need is a bicycle. It can be an old vintage bike that you found in a yard sale, or one that your child has outgrown. Any bicycle style will do. The condition doesn’t matter. A coat of primer and paint will fix that in a hurry! Think outside the box. All sorts of bicycles will work. Kid’s trikes, old fashioned big front wheel types, miniature store bought bicycle planters and double seaters all have their own appeal that can be made to work in your garden setting. 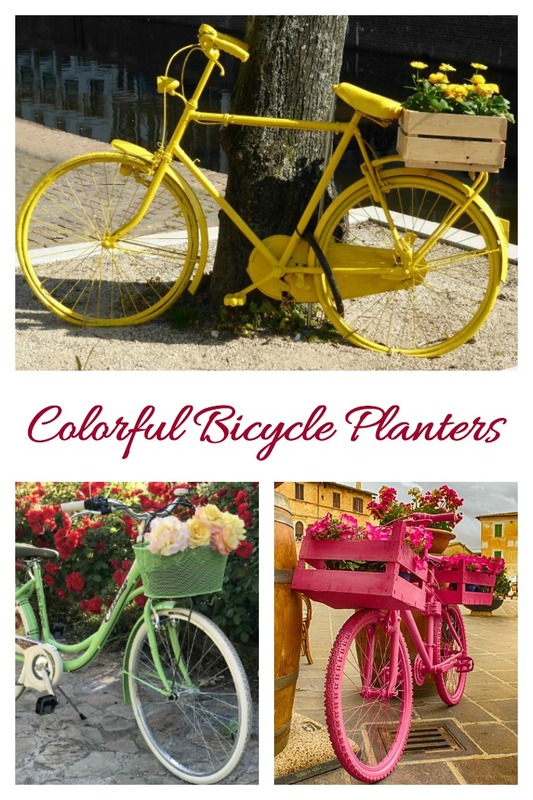 One of the biggest appeal of a bicycle planter is that you can use color to coordinate with the flower choice. And color adds a pop of color in your garden when nothing much is blooming, as well. Don’t be afraid to go really wild with color. Some of my favorite designs shown below are the bight orange and bright yellow colored frames of the bikes. If the container has holes or openings, just line it with sphagnum moss and add the soil for a leak proof look. Think outside the box. 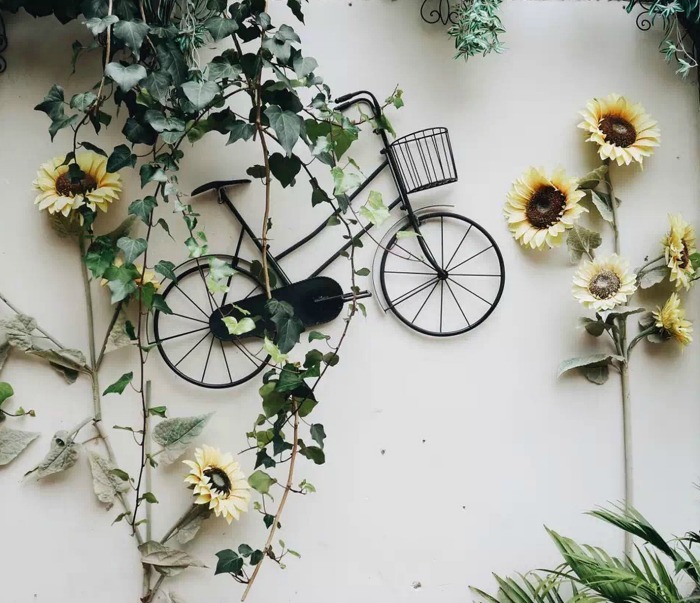 We all know that bicycles use baskets to carry things but even something like a long plastic plant pot can be attached to the bicycle for a planter look. 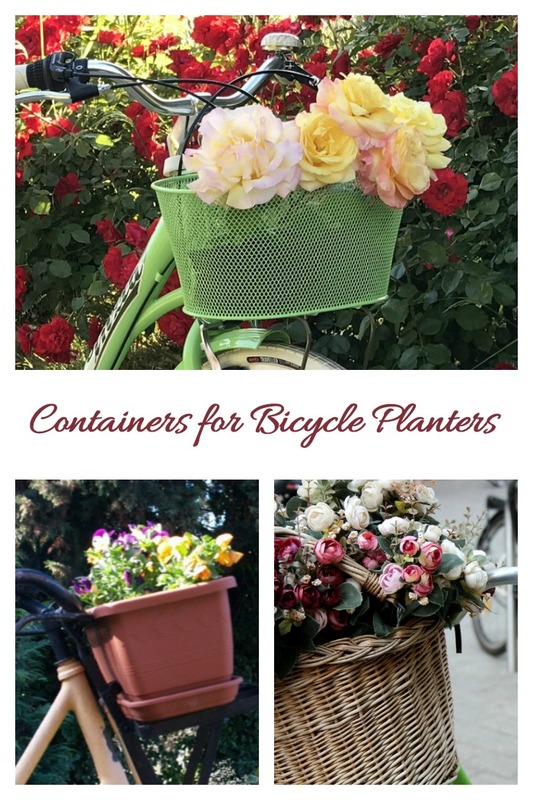 Bicycle planters generally have a feminine look to them, so any plants that do well in cottage gardens will be right at home in them. Bicycle Planters in the Garden. Using items around the house in new and unusual ways add a whimsical look to garden settings. 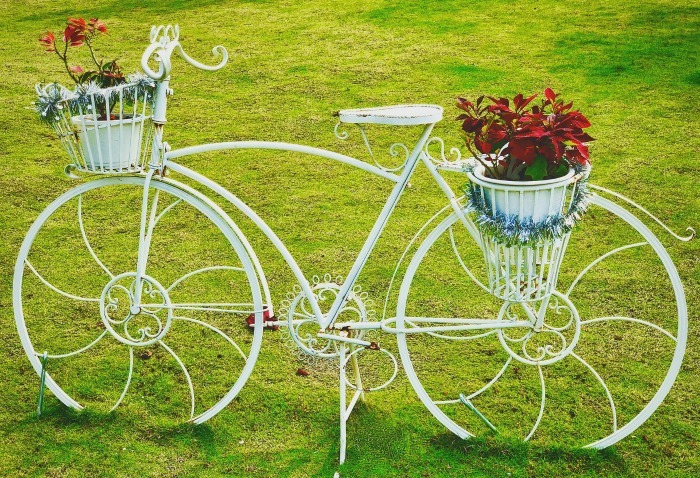 For today’s ideas, we are seeing how to turn old bicycles into charming garden planters. Just use can of paint, some fun baskets and your plants, and you are good to go. 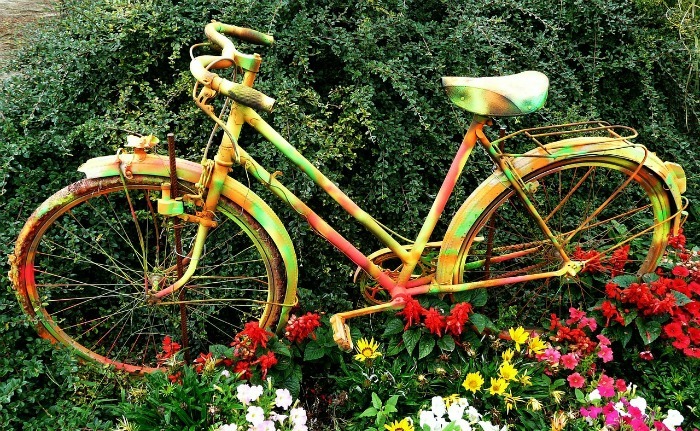 Do you have a bicycle that you could use for a planter? Why not try one of these neat ideas? 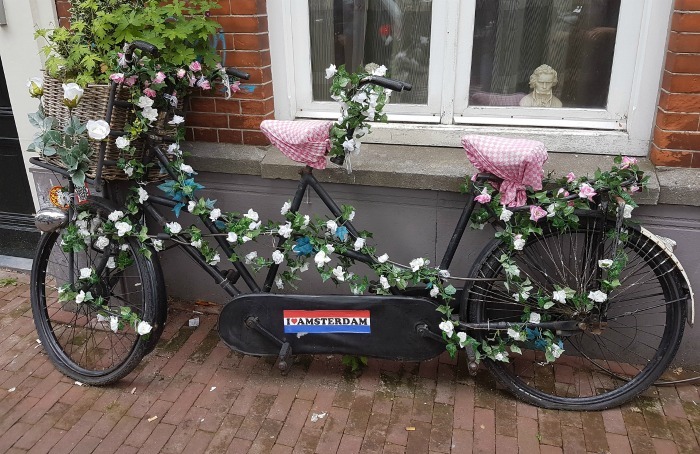 The entire frame of this double seater bicycle is covered in flowering vines. I love the way that the pink flowers are highlighted with the checked gingham seat covers. A large basket completes the look at the front. 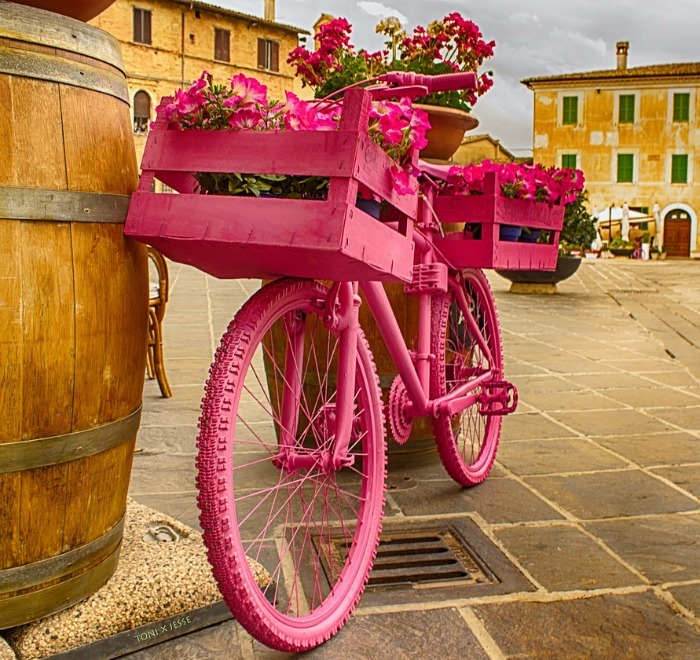 The frame of the bicycle and some crates are painted a baby pink color and then they are planted with deep pink petunias. 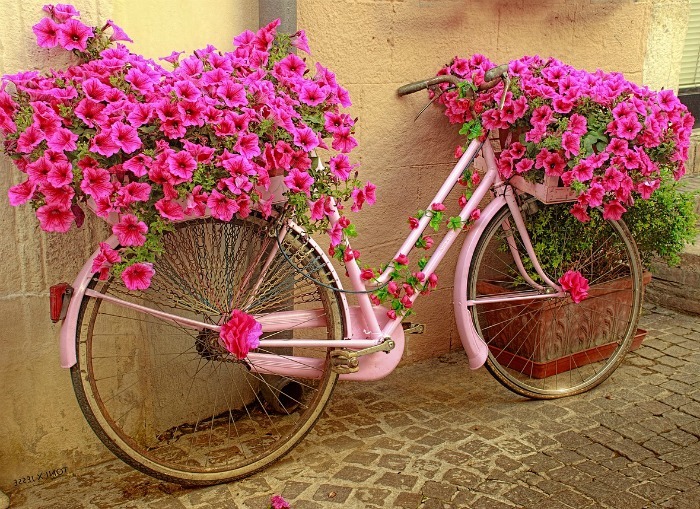 I love the way the vines of pink flowers climb up the frame as well as the use of pink accent flowers on the center of the bicycle wheels. How perfect is this for a plain white wall? It reminds me a bit of the flying bicycle scene in E.T. 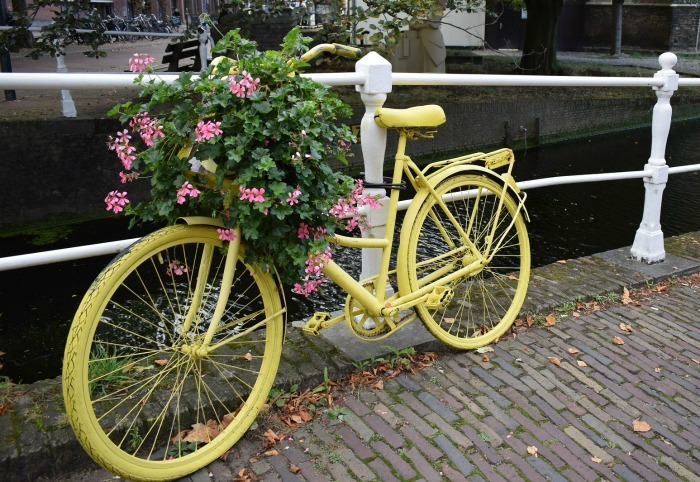 All the bicycle needs are some yellow and brown daisies in the small basket! This thin blue bicycle gives a modern look to this display against the bright red wall. Love the colors! This whimsical bicycle planter complete with small tennis shoe planters gives the impression of the bike having a ghost rider. How sweet! Image shared from my friend Carlene at Organized Clutter. This planter has such a cottage garden look to it. 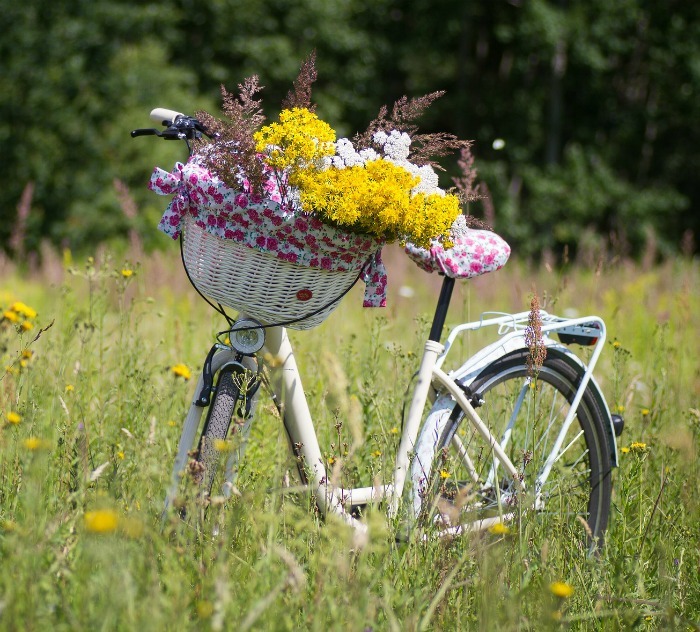 The wildflowers go so well with the fabric lined white basket to match the colors of the bicycle. 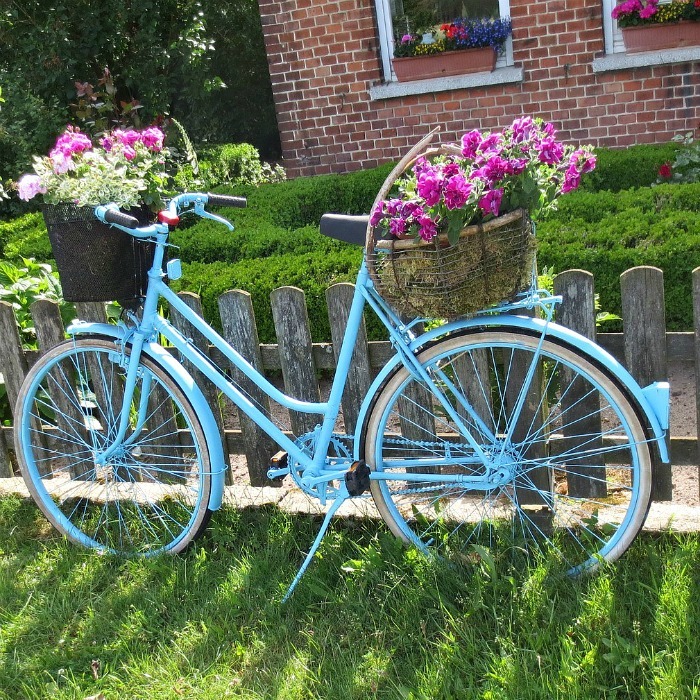 The rustic picket fence is a nice backdrop for this baby blue bicycle with two basket planters. Colorful annuals can be changed out with the seasons. Yellow is the theme here! 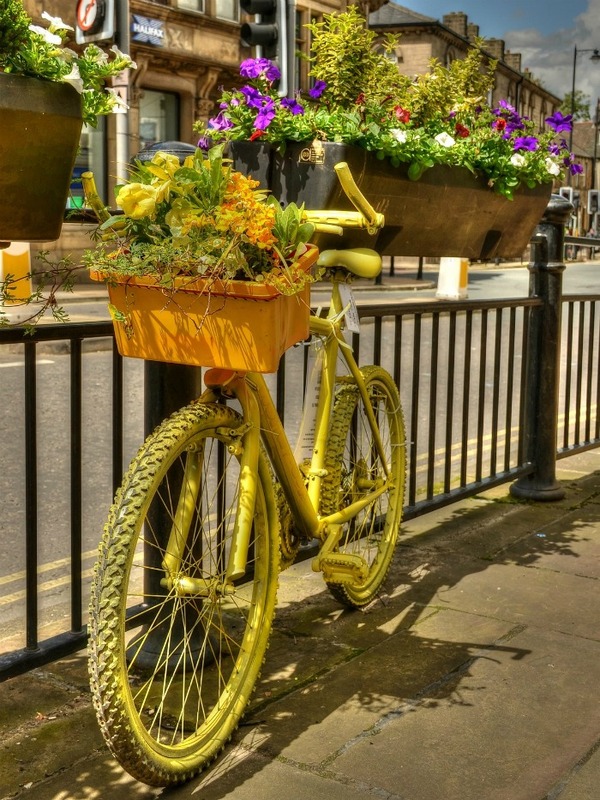 This fun yellow bicycle planter looks as though it is part of the scene behind it with the rail baskets. The yellow painted wheels add loads of texture to this look. This is one of my favorite ideas. 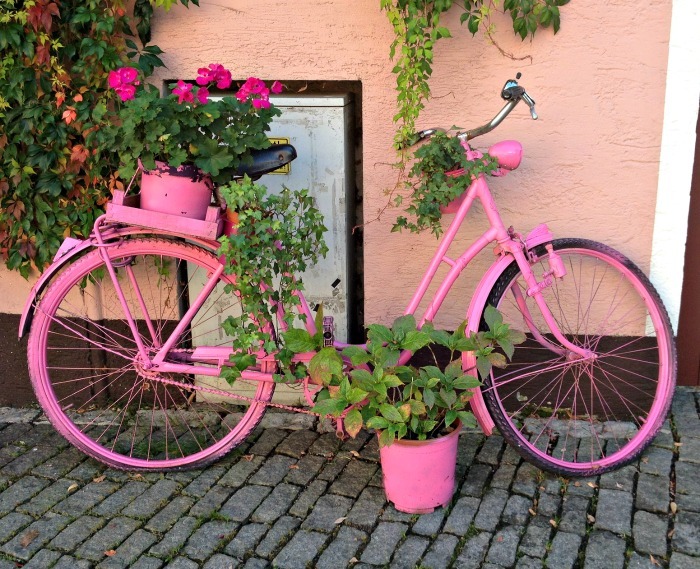 A can of dark pink paint it put to good use for this bicycle planter. Two wooden crates and the whole bicycle gets a fresh coat of paint and then bright pink flowers are added. The look is monochrome but so effective. What a fun idea this is! Use it for indoor plants on a black wall, or outdoors on the side of a garden shed. 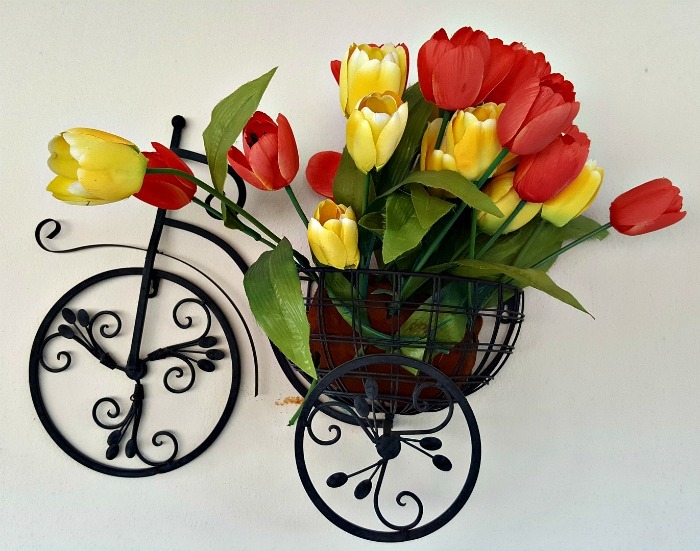 Just take a small tricycle planter, add some potted tulips and you have an adorable wall accent. The flowers don’t need to match the color! I love this color combo. 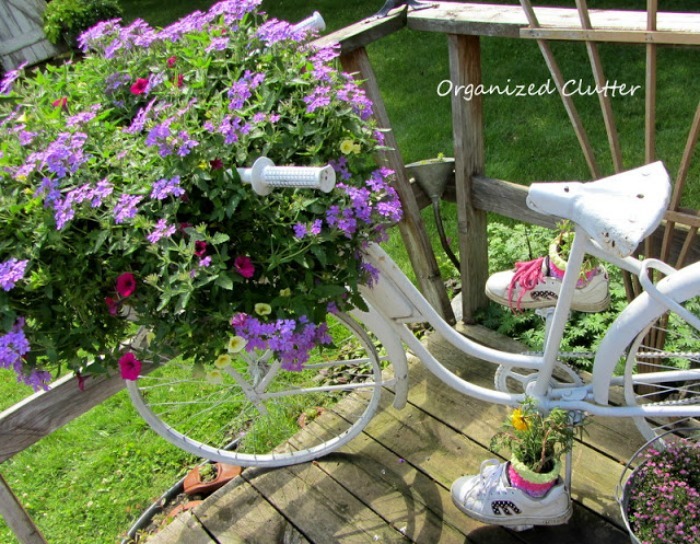 The bicycle and baskets are both painted yellow and purple petunias add a nice splash of color as a contrast. The brown sphagnum moss completes the look. This fun combo uses a pink painted bicycle with a back basket. Along side of it on the ground is a plant pot of the same color with a trailing vine. As the plant grows it will cover the frame of the bicycle! 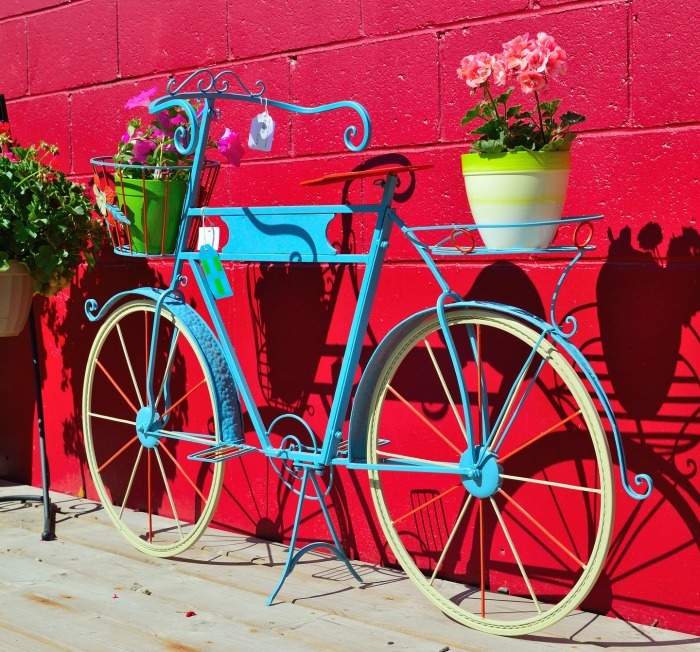 Color is the key when it comes to charming bicycle planters are these designs will show. This charming yellow bicycle planter is offset beautifully with the pink geraniums and pure white fence. It sets a peaceful and calm mood near the waters of the channel nearby. Orange you glad you like bright colors? 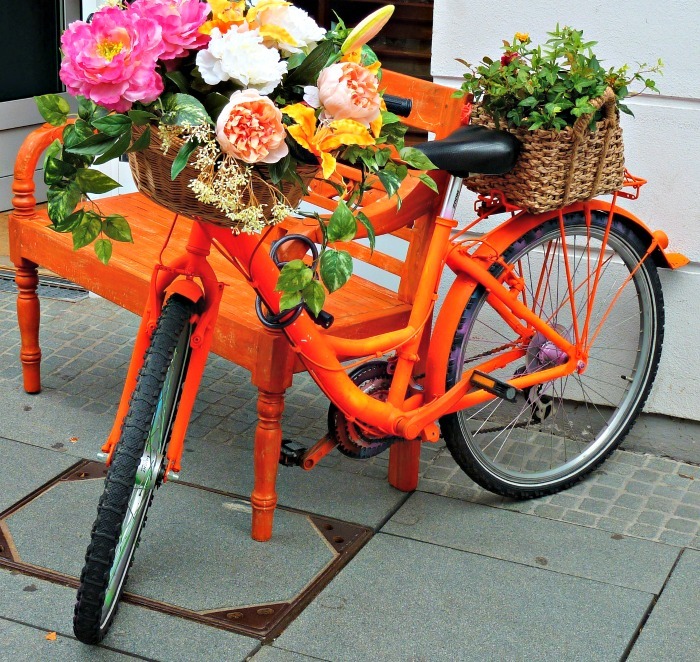 Two baskets grace this bright orange bicycle planter for maximum effect. What a great way to showcase peonies! This lime green bicycle planter has a basket that is surrounded by yellow daisies and a brown leather seat and handlebars. It has a vintage look that is very appealing. Even a child’s bike will work as this charming photo shows. 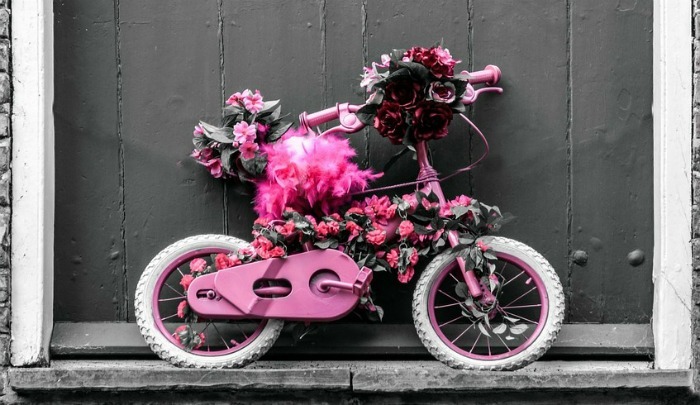 The bright pink flowers cover every part of the bike and it looks fabulous against the plain gray door. 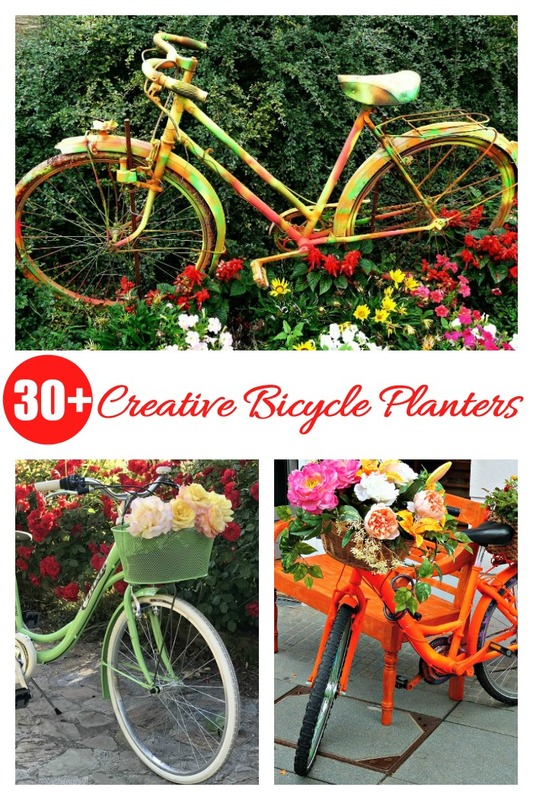 The bright yellow bicycle planter just screams summer to me. 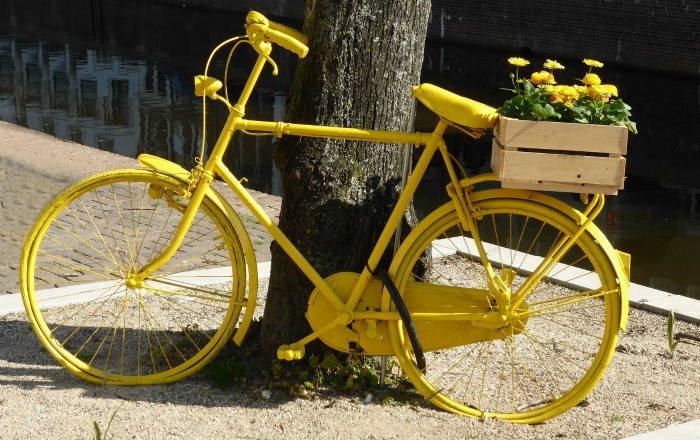 The entire bicycle has been painted yellow and is decorated with sunny yellow mums. I think I would have painted the box planter yellow, too! Don’t have time for a painting project? 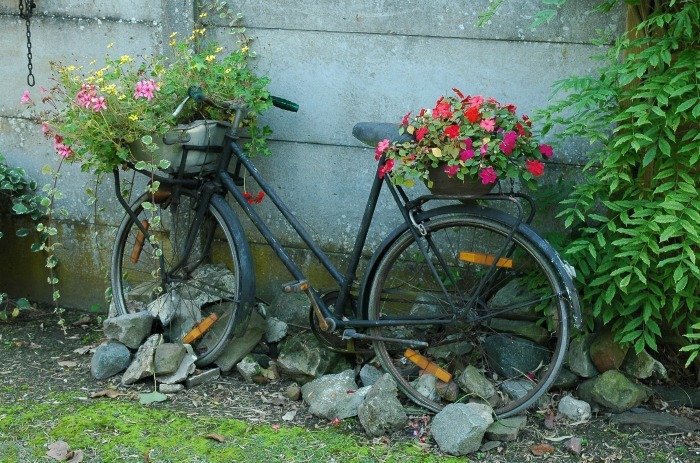 This vintage look shows that even an old and worn looking bike can be recycled into a fun looking planter. To me, this design would look perfect in fall when everything in the garden is starting to die down. The stark gray and charcoal colors of this mini bicycle planter offset the pink geraniums beautifully! This pretty designs show that you don’t need baskets or planters for a unique and creative look. The color does all the work for you. 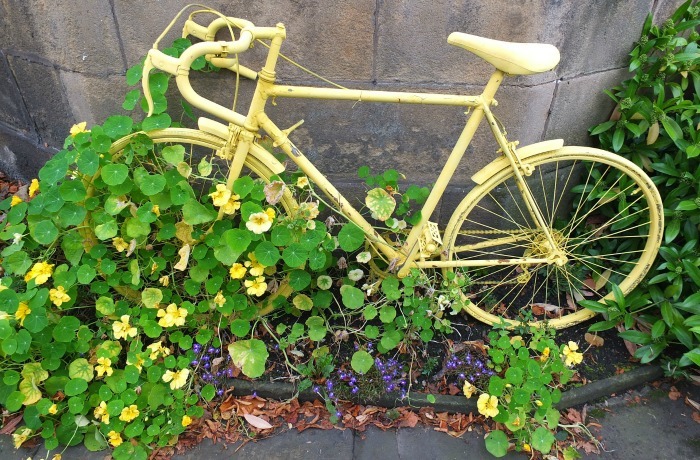 Yellow nasturtiums climb over a starkly painted yellow bicycle for a dramatic look. This pure white metal bicycle contrasts starkly with the red coleus for a dramatic look that has a roaring twenties feel to it. Sometimes, color can be understated and still work! This fun look uses pale green for a calming effect. 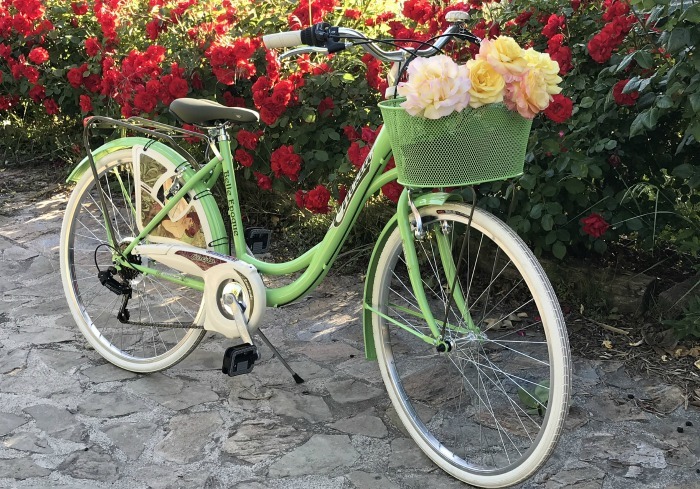 The mesh basket matches the frame of the bicycle well and the female frame has a graceful and feminine look that pairs well with the peonies. 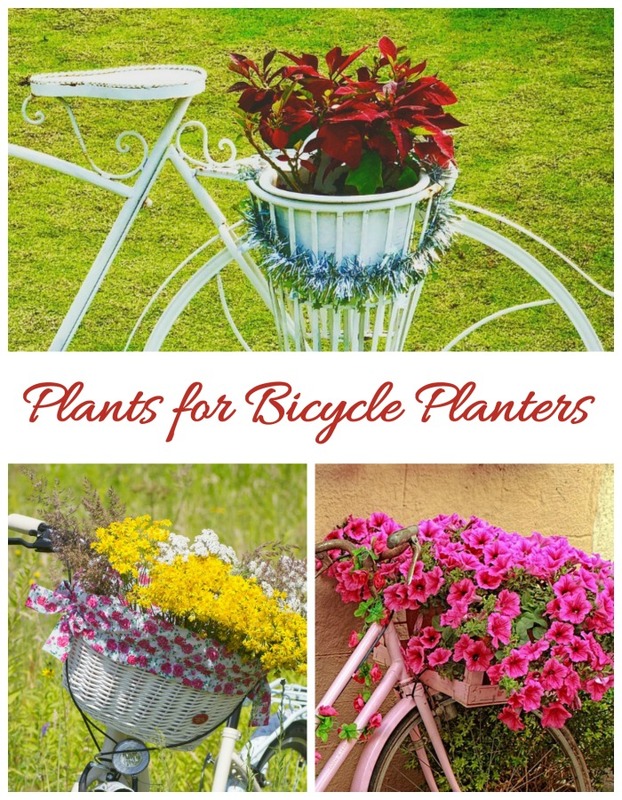 Still need some more inspiration for bicycle planters? Check out these designs. Now it’s your turn. 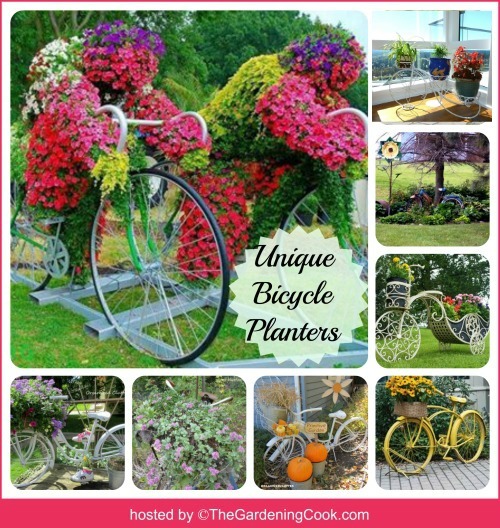 Which is your favorite bicycle planter design. Do you have one in your garden that you would like to share? Please upload a photo of it to the comments below! Would you like a reminder of this post later? Just pin this image to one of your creative gardening boards on Pinterest for easy reference when you need it. Admin note: This post first appeared on the blog in July of 2013. I have updated the post to add more bicycyle planter designs as well as a video for you to enjoy. My pleasure. Hope it drives some traffic to your site!